Sunday – I took the week off from BoInk, because of my cold. 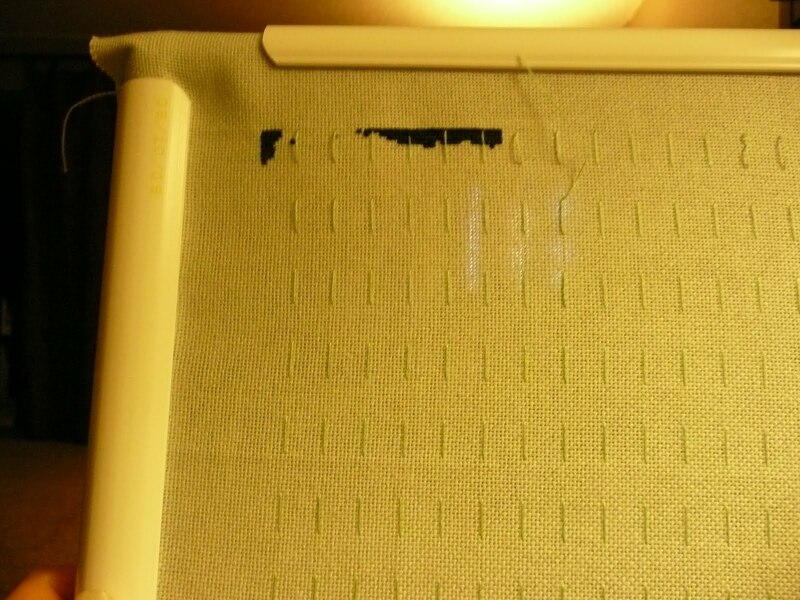 I was planning to work on one of the interior yellow borders, and even though that wouldn’t have required much concentration, I just had that plugged, slightly dizzy feeling – it was too hard to hold my head up to watch TV, let alone stitch. Monday – I skipped on Advent, too. Tuesday – I started Fairy Sisters! I did all the 310 (black) on the first page – impressive, right? LOL It was probably about 100 stitches. Wednesday – exchange day, so it’s still secret. I did actually purchase an Altoid tin earlier in the week so I could make sure the design would fit. Thursday – Advent. Last week I left you with the top of the 11, and some branch things. 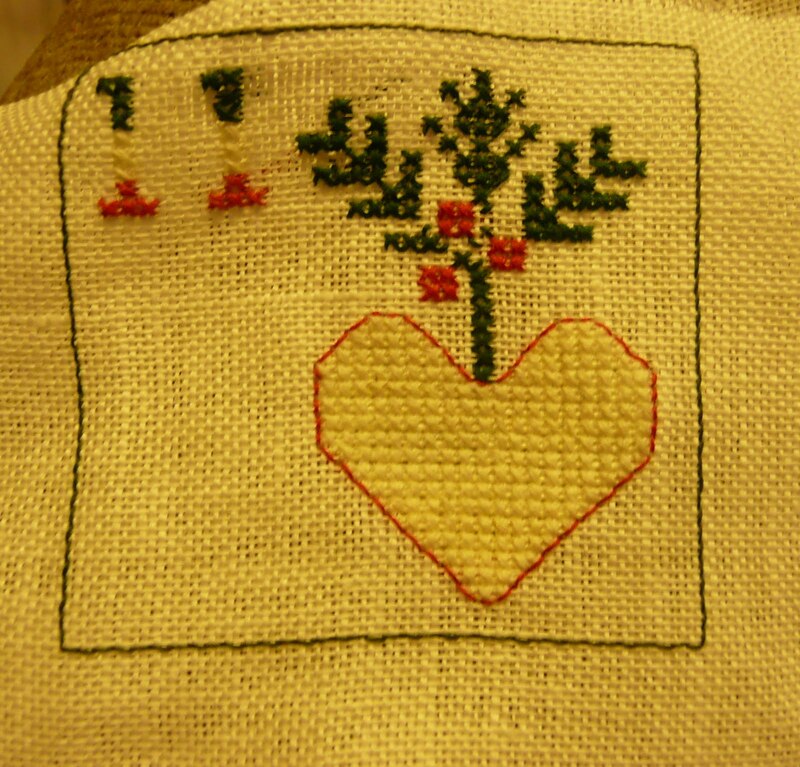 This week I stitched the rest of the 11, and a heart, out of which the branch things seem to be growing, and some berry-type things. I also managed to backstitch around the heart – I was really starting to feel better that day. Friday-Saturday – I finished one “pull” of thread of 939 (really, really dark indigo). A little explanation – I like to work with a long thread – it goes back to my seed bead-weaving, and my hatred/fear of changing threads mid-project. Yes, I know it leads to twists and tangles. But I also don’t have to finish and start as often. 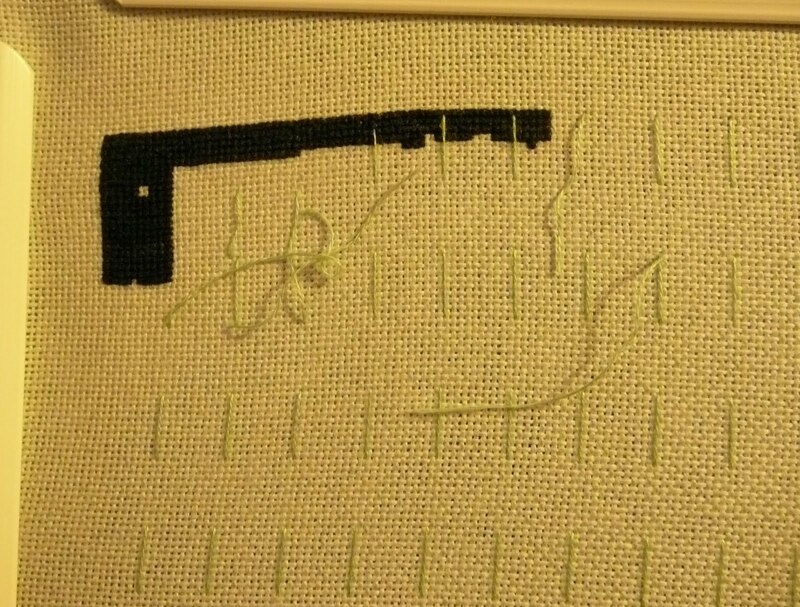 I’ve recently discovered the loop method of starting, which gives me the illusion of my thread going farther in each project than it really actually does. I use a single strand, fold it in half, thread the needle, come up at my starting point (holding onto the loop) and bring my needle down through the fabric, into the loop. And just like that, a double-strand of thread, no knots, no holding it in place while I stitch over it. But because I work with long strands, it takes me longer to finish the 6-strand section I pull off. So I mark my stitching time in “pulls” of thread – as in, “I’ll get up and make dinner after I finish this pull of thread.” Because I spent Friday afternoon browsing the iTunes store for crafty podcasts, I didn’t finish that pull until sometime Saturday afternoon. My breathing is back to normal, so I’m determined this week to get back to walking. I was doing great, and I’m not going to let a late-season cold totally derail my attempts to get healthy this time. And 7 of the 10 people I passed the blog award to have not picked it up yet! Go down to Thursday’s post and see if I chose you!! Sounds like you had a very busy stitching week in spite of the cold. Looking forward to the pictures! Wow!!! You are one busy lady!!!! !